Anime has always lent itself particularly well to the JRPG form. There’s something about the typical shonen narrative of a protagonist slowly grinding their way from small-town nobody to world-beating juggernaut that meshes flawlessly with the hidden mathematics behind turn-based combat and inventory management. Slice-of-life anime often finds its way onto a handheld as a visual novel, too. While the result isn’t always pretty, there’s something logical in the transition from manga to television screen to console. Little Witch Academia: Chamber of Time does not manage that transition gracefully. It’s a game that is torn between a desire to be a traditional JRPG and a Dragon’s Crown-style side-scroller beat-em-up. 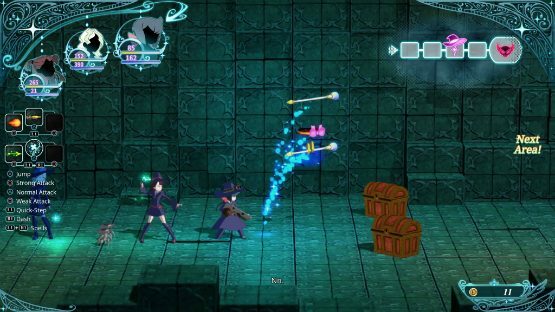 Much like its characters, a group of adolescent witches at a school for magic, Chamber of Time has varying ideas about how it wants to be when it grows up. Also like a teenager, though, the game never makes up its mind, and the result is a frustrating, if not slightly endearing, mess. 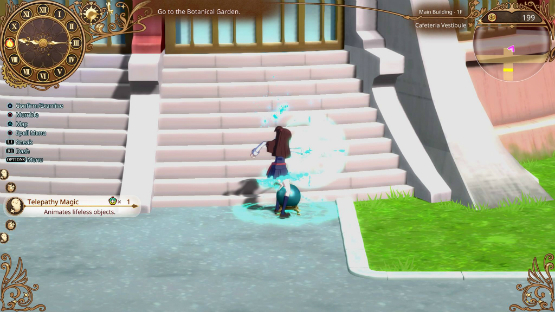 Well before the first hiccup in gameplay, though, the premise of Little Witch Academia: Chamber of Time sets the stage for the game’s sloppy execution. 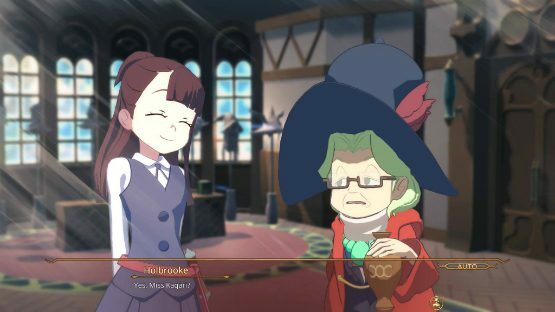 I am passing familiar with the franchise, and the game actually does an excellent job of offering a refresher course in main character Akko’s option to reminisce about the major characters she meets during the journey. The characters have also been lovingly recreated using some beautiful animation, the resulting aesthetic feeling like the events are taking place during an episode of the television series. The issue, though, is that the game never feels like it is actually a Little Witch Academia adventure. The players are all well-practiced and the stage is familiar, but the story itself is stilted, bordering on purely uninteresting. There are no stakes, but there’s little in the way of character development or interaction that feels worth the lowered dramatic value. Because the game is forced into a summer vacation narrative that can’t actually affect the characters in any meaningful way, nothing really happens. Nobody grows, something that is only reinforced by the game’s obsession with its Groundhog Day-inspired tale of repeated days. When I can walk away from a game, get asked about its thematic concerns, and be reasonably satisfied that shrugging in response covers most of it, it isn’t a great sign. It’s a shame, too, as the visuals involved are absolutely awesome, and a great treat for fans of the show and the world it inhabits. 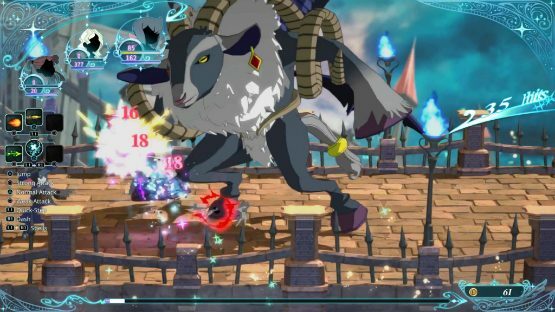 The bulk of Little Witch Academia: Chamber of Time‘s gameplay takes place in an underground labyrinth. It’s standard dungeon crawler fare from a design standpoint, as the locations change in small ways and other, bigger dungeons are unlocked as the game progresses. Once again, the actual levels themselves are a delight from an aesthetic viewpoint, but are let downs in practice, as there isn’t much about them that sets them apart in a mechanical sense. The traps are the same, the enemies all equally moronic. I suppose here is where I should state the most obvious concern I had with the game before going in – that a sidescrolling shmup approach to a game that seems so tailor-made for RPG combat would find difficulty resonating with its source material. Surprisingly, the game captures the feeling of being a witch-in-training pretty well, almost too well, in the sense that the characters you aren’t controlling are really, undoubtedly, unfathomably stupid. When your character moves around a trap, you can bet that your party members will, without missing a beat, walk directly in to it. When an enemy starts spamming close-range attacks, they will be there to receive every single one of the blows, as though they are getting paid-per-hit. I also had some issues with combat at its core. One character in particular, Constanze, seemed as though she couldn’t help but break the game’s ability to function. Naturally, though, she was my favorite, so I soldiered on despite her tiny robots becoming so interesting to enemy AI that I could comfortably hang out in the back corner of the screen, spam long ranged attacks, and never be troubled. Hit boxes are finnicky little beasts, leading to some frustrations with spell-casting that make what could have been a simple, fun experience into one that overstays its welcome quite quickly. Despite all of the above, Little Witch Academia: Chamber of Time has some redeeming qualities. The musical score and visuals are pitch-perfect for the source material, and the characters are allowed to at least let their personalities shine through even if they don’t get any development. These small glimmers of beauty are buried under the ugliness of an extremely out-dated environment, though. It’s 2018. I’m pretty sure I’ve played a few games that were watching me during the cinematic breaks, learning, waiting with some sort of unholy purpose. How does this game not have fast travel on a map that has over ten necessary and fairly large locations to move through? One of the early quests takes about fifteen minutes, but only one or two of those are spent actually doing anything. The rest is consumed by going to one location, backtracking to the literal other side of the entire schoolground map, and then going back again. My reward? A cutscene that told me I had to go back to the place I just came from to progress the story again! This is compounded by a progression system that sees characters appear and disappear from the map based on the time of day. Unfortunately, time isn’t progressed particularly easily, and it’s yet another frustrating, time-consuming experience that feels like it is blocking players from actually experiencing the game. Ultimately, Chamber of Time is hamstrung by its inability to pick a genre. It takes a few of the fun aspects of both its inspirations, but combines them with much more of their frustrating elements, and the resulting concoction is a poison even Sucy wouldn’t find appealing. It’s not that the game is bad, but it is frustrating, doesn’t capitalize on its source material enough, and is in a weird spot where its story and cutesy approach will never win over fans of the genre its gameplay is in. Little Witch Academia: Chamber of Time is probably a safe pick up for diehard fans, a gamble for those with a little bit of familiarity like myself, and a dangerous choice for anyone outside of those two categories. For a title based on a world filled with magic, the game itself has very little of it to be found. Little Witch Academia: Chamber of Time review code provided by Bandai Namco. Version 1.02 reviewed on a PlayStation 4 Pro. For more information on scoring please see our review policy.